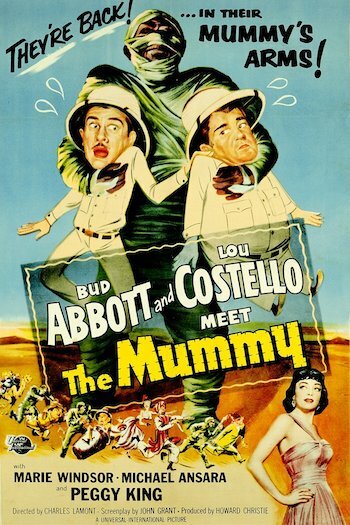 By 1955 Abbott and Costello had met just about every monster Universal had to offer. The only one that had escaped their withering satire was the Mummy. Of course by the end of the Kharis films in 1944, many probably already believed that the Mummy was a joke. 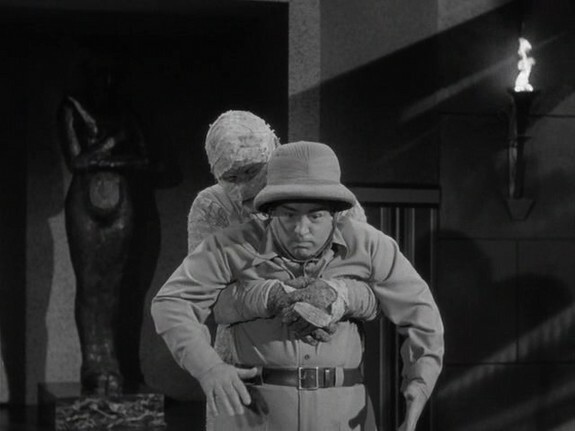 No matter though as Universal cranked out one last gasp in the Abbott and Costello meet the Monster of the Week oeuvre. This one looked chintzy and the gags were more rickety than ever, though the film was not without its amusing moments (almost exclusively provided by Costello). The film begins with our stars in Cairo. A&C overhear a conversation about a mummy being found and that it’s going to be shipped back to the USA so they decide to apply for the job of watching over the crate as it gets shipped overseas. I think we all recall how this same job worked out for them in Abbott & Costello Meet Frankenstein. Bud and Lou head over to the professor’s home to see if there is still a position open for “two idiots to watch runaway mummy”. Before they get there though, we are introduced to some villains. There are two sets of villains in this flick, which serves to give it a manic quality. I suppose they hope so much is happening that we won’t stop to think that we’ve seen all these jokes before in other A&C efforts. Sometimes it works, sometimes we still remember they haven’t developed any new material in something like 15 years. One set of villains are of course the secret sect of losers who always crop up in these mummy flicks. They’re a bunch of guys without jobs who are stuck in the past and think that anybody still cares about their crummy mummy and his forbidden bride. Whenever someone shows up to excavate the tombs they try to stop them. Talk about doing the same old shtick. The secret sect wants the mummy, Klaris, and his medallion back so he can protect the long dead princess. I’ve left out the most ridiculous part. 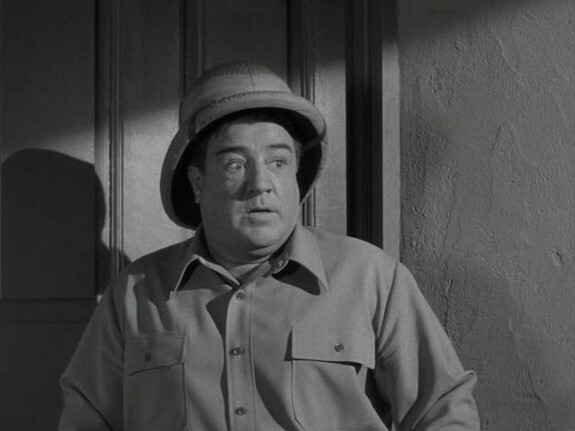 The high priest in charge of all of this is played by Lumpy Rutherford’s dad from Leave it to Beaver! Bud and Lou get to the professor’s place and can’t find him because he’s already been offed with a blow gun dart to the neck by one of Mr. Rutherford’s goons. We spend the next 20 minutes messing around the place with Costello doing his bug eyed looks and his patented “Aaaabooooott!” scream while bodies and mummies are disappearing just like you would expect in a sequence like this. The best part was when Bud and Lou finally establish that the professor is dead so Bud has Lou take some pictures of the dead guy so that the police will have proof that a murder has taken place. Then they send the photos off to the cops anonymously so they don’t have to get involved. The next day, Bud reads a newspaper account of the murder and sees that one of their pictures has been used in the paper. Of course it’s the one Lou took when Bud was standing next to the body! This means our heroes are now fugitives from the law and the two sets of goons, so they go undercover as a couple of beggars. I’m not sure why, but this also means that Lou has to pretend to be a snake charmer. By now they are in possession of the mysterious medallion that everyone is after, having found it in the professor’s place before they eluded all of their pursuers. During all this chasing and hiding they manage to have time to go to a café for a leisurely bite to eat. I also think that it was somewhere around this time that a musical number was shoehorned in to pad this thing out another five minutes. A&C begin bantering back and forth with their hamburgers and try to trick one another into eating the medallion! I have absolutely no idea why they wanted each other to eat it. If it was cursed, I’m not sure what eating it would do and if that was the reason, then why not just chuck the dang thing into the Nile? Eventually, Costello gets tricked into eating it, but once he bites into it, why does he keep eating? I’m thinking he needs to be institutionalized or at the very least have a guardian of some type. After some scenes involving the bad guys, Lou, and an x-ray machine, everybody tromps off to the hidden temple where the treasure, the Mummy, and all the bad guys are. At this point, I feel compelled to make a comment about the Mummy, as he’s portrayed in this picture: abysmal. First of all this guy is in the worst mummy outfit I have ever seen. Basically, it looks like he’s wearing coveralls that have been sewn to look like bandages. This outfit bends and gaps when he moves around and doesn’t even look like it fits him well. The look of the bandages is awful. They just look like some dried papier-mâché. I thought I was watching a homecoming skit where somebody was too lazy to wrap themselves in toilet paper so they just put on a low-priced mummy suit from Wal-Mart. The ending of this movie is one these things that’s so “silly” it veers off into “ridiculously idiotic.” The Mummy gets himself blown up in the temple and then A&C come up with an idea to keep Klaris alive in everyone’s memory. They open up the Kafe Klaris complete with house band dressed as mummies! Fred Rutherford is now the head waiter or something! All the goons now have jobs at this place. I think you could probably say that this predicted the whole trend toward theme restaurants, and it was just as dumb then as it is now. 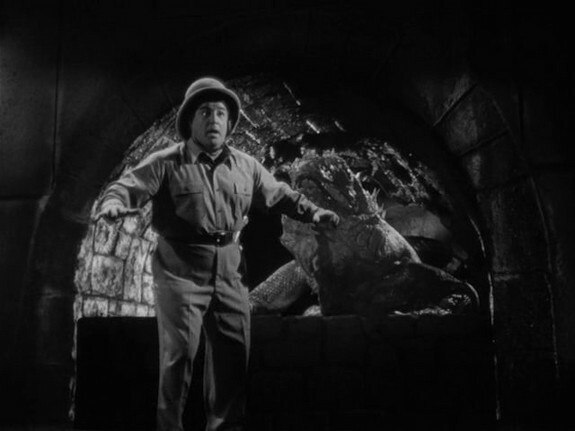 A completely ignominious end to the Universal Mummy cycle though there were some amusing moments from the rubber faced and often very loud Lou Costello.